But, never fear, while Sunday was a rare exception, I have certainly continued to drink, enjoy and learn about wine, albeit in a far more casual and hurried manner than in the past. A year ago I was a giant blob of a pregnant lady anxiously awaiting the birth of baby Evan, and the ability to move around freely. I was reading wine books like mad, a new one every couple days, and just dying to start drinking all the fascinating wines I was reading about. How much things have changed in that year. Despite the insane schedule I’ve been barely keeping up with this month, I did find some time to have some enjoyable wine experiences. Several weekends ago we took a day trip up to Napa to spend the afternoon with my sister-in-law who was up there with her roommate. 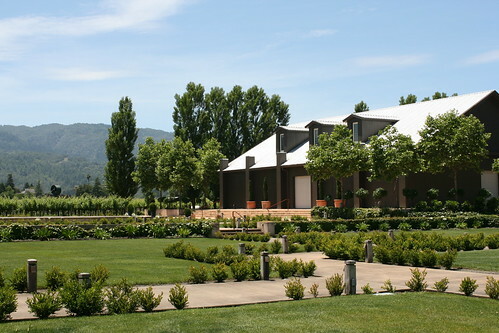 It was a perfect excuse to revisit Kelham Vineyards, the fantastic place we went while in Napa last October. This time it wasn’t pouring rain so we were able sit out on the patio. The weather, perfectly sunny and just a shade above chilly, couldn’t have been better. I could have sat out there, sipping wine, forever. With the same carefree attitude, despite having a sweet little newborn baby, winemaker Ron Kelham was pouring wine and his brother, the other winemaker, Hamilton, was cooking pizzas in an outdoor brick oven. Wine country doesn’t get much better than that! In stark contrast, we went from there to Mumm Napa. While I haven’t been able to get Myles on board, I really wanted to expand our selection of sparkling wines. While the place was crawling with corporate-ness, we tried their high end sparklers and I was quite impressed. I haven’t really had enough different sparkling wines to be a super informed judge, but in my mind, bubbles are hard to beat. We ended our afternoon sitting on the back patio at Hope and Grace’s tasting room in Yountville. I wanted to return there following our first visit just over a year ago. They had a great pinot and I read online they had a riesling this year. Amazingly, the woman working there remembered me from before (guess not too many women come in to taste when 8 months pregnant?!). 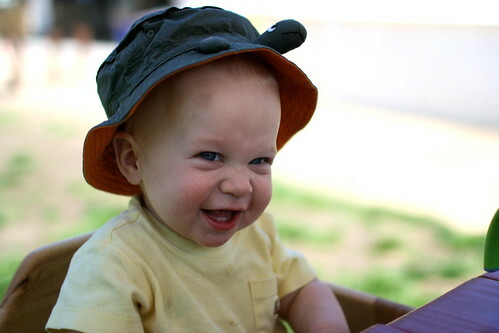 Have I mentioned yet that both the boys were with us? I love how much fun they can and do have visiting wineries! So speaking of Santa Lucia Highlands (that’s in Monterey County, CA) pinot noir, where Hope and Grace’s great one is grown, last week was my monthly wine club meeting. We did a great tasting of 10 pinot noirs. Nine of them were from California, each from a different growing region through out the state: Anderson Valley, Carneros, Marin County, Russian River Valley, Santa Cruz Mountains, Santa Lucia Highlands, Santa Maria Valley, Santa Rita Hills, and Sonoma Coast. The tenth wine was a mystery, although the screw cap gave it away for us- New Zealand. The wines in this lineup were, overall, really fantastic. I could have happily sat and drank a glass of most of them, which is not always the case with the wines we try. What was super difficult, however, was trying to guess which region each wine was from. I’m pleased to say that I was correct on two: Santa Lucia Highlands (thanks, H&G!) and Santa Maria Valley. One was horribly corked (turned out to be the Sonoma Coast representation), and my first wine from Marin County may be my last as it was my least favorite of the evening. The winner of the evening, was the Santa Cruz Mountains wine from Neely. It had a sweet aroma, almost like candied fruit, with some herbs. It had great balance and good fruit. This was the one I was still slowly sipping when we suddenly realized it was midnight! As I did last July when Evan was born, I plan to open a bottle of sparkling to celebrate my baby’s first birthday next week. And then, we are going on vacation. Our first trip in more than a year and a half that isn’t centered around wine (we’re concentrating on the beach this time). Although, we are scheduled to visit one adult beverage producer... a BREWERY. Gasp! Clearly I’m having some trouble keeping up. We’re only one day shy of a full month since my last post and it’s been weeks since I drank these last two Burgundies. I hardly know what to say about them! First up, Meursault, where white wine dominates. There are no Grand Cru wines here, but many Premier Cru and the quality is apparently pretty even across the region. The wine I drank, from Louis Latour, was lemon-yellow and had aromas of fresh straw, lemon and a little cream. It had a medium body and was creamy up front, but had a bitter acid on the back palate with a long finish. And finally, for my last Burgundy, I thought it appropriate that I try a Grand Cru. While I’m sure that it’s not the same as a DRC, it’s a Grand Cru Burgundy for only $55! 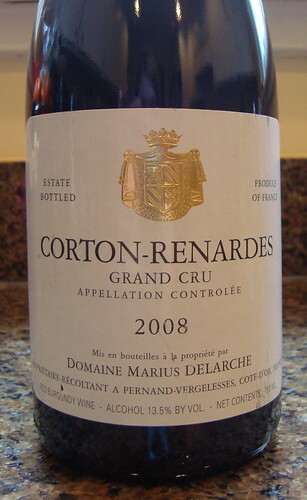 This one is from Corton, and one of the top areas within it, Les Renardes. This particular Corton-Renardes, from Domaine Marius Delarche, was ripe and fresh on the nose, with eucalyptus and a hint of raspberry. It was very smooth, as I expected a Grand Cru to be, with medium body. It was tangy and acidic, as undoubtedly it would improve with more bottle age, but the tannins were quite subtle. There wasn’t a lot of fruit, and it was a little green, but this was a 3-year-old Grand Cru Burgundy that we clearly drank too young. The sacrifices I make for the sake of Give Me Grapes! Unfortunately, I drank these wines long enough ago that I don’t think I can fairly give them scores. However, these were, at least according to the labels, the best wines of the Burgundy bunch and why I saved them for last. They definitely were the best upon drinking them as well. So, what comes next? First, I must think of ideas to make sure I don’t let one month lapses become the norm. But, I’m thinking it’s time to move to another classic wine region, outside France.